(Nanowerk News) Researchers from Drexel University have developed a nanopipette for highly localized and sensitive intracellular chemical analysis of single living cells. 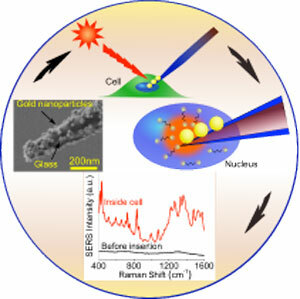 Based on the principle of surface-enhanced Raman spectroscopy (SERS), the nanopipette allows in situ monitoring of cell function in real time ("In Situ Intracellular Spectroscopy with Surface Enhanced Raman Spectroscopy (SERS)-Enabled Nanopipettes"). Nanomedicine is a new field, which emerged due to the recent advances in nanotechnology. Gogotsi’s group has developed the first SERS-active nanopipette which works as a real time sensor of local intracellular biochemical processes. The tremendous advantage of SERS is that it is completely label free, yet a highly sensitive method for molecule detection. For the first time, the researchers were able to measure in situ cell response to changes in its environment. The nanopipettes represent pulled glass capillaries with specially designed gold nanoparticles attached to their 100-500 nm tips. The fixed layout of the gold nanoparticles on the probe tip allows to overcome the limitations of the traditional approach for intracellular SERS, which uses metal colloids that tend to aggregate in cells causing data uncertainty. Moreover, glass pipettes are widely used in cell biology and there is an array of instruments available for the pipette manipulation inside cells. This means that SERS nanopipettes could be directly introduced to any biological lab equipped with an optical microscope, micromanipulators, and a Raman spectrometer. The SERS-active pipettes can perform the same injection/probing function as conventional pipette, but adds an important analytical capability. SERS-active nanopipettes open a new realm of possibilities such as cancer detection on a single cell level, staging of cancer using weakly expressed biomarkers, and cell surgery. It has been demonstrated that the positioning of the nanopipette tip, either within the cell nucleus or cytoplasm, can be clearly distinguished through the measured SERS. Feedback on the positioning of the nanopipette tip within cells will provide valuable information during cell injections, single cell surgery or for in situ study of cell signaling. The applications of this tool are not limited to nanomedicine. It can be used anywhere high sensitivity detection is required, from analytical chemistry to homeland security and forensics.